What is the Best RV Mattress in 2019? If you’re in a hurry and looking for the best RV Mattress, the Live & Sleep Ultra RV Mattress is the best one. Whether you’ve been bitten by the year-round recreational vehicle living bug or spending time in one of these motorhomes on a temporary basis, the luxury and comfort of your bed should not be compromised. With the usually harsh weather elements and other unfavorable conditions in RV parks, campsites, and other areas where most people live in these mobile homes, why would anyone want to sacrifice their comfort especially during sleep? In fact, RV beds should offer true relaxation to make you want to spend as much time as possible in your trailer or camper van and this is where the quality of the mattress you purchase comes in. Sadly, most mattresses that come with RVs are notorious for their inferior quality which leads to a host of problems including back pain and insomnia. This is why it is critical to buy a comfortable RV mattress separately. In my experience, a Short Queen Size with dimensions of 60 inches x 74.5 inches makes the best RV mattresses as long as there’s enough space to accommodate it. Take a look through our comprehensive RV mattress reviews today and choose one that best suits your sleeping and luxury requirements. Who knows? You could be more of an RVer that you ever imagined. RVs have been part of American culture for decades and at the moment, the number of Americans owning one type of mobile home or another is estimated at roughly 10 million (a quarter of Canada’s population). Out of these, over a million Americans live in RVs full time. So what is an RV? RV is an acronym for Recreational Vehicle, a wide range of motor vehicles ranging from trailers to motor homes as well as pop-up campers. While they were originally manufactured for temporary travel around the country, RVs have evolved to become a way of life for millions of Americans who have set up permanent homes and live in them full time. RVs feature a wide range of beds including regular beds, bunks, and fold-out sofas. As such, finding the best RV mattress can be a bit tricky due to factors such as the type of vehicle as well as the bed type, frame type, firmness, budget, and size. As an RV owner, the choice comes down to choosing a complete mattress or a mattress topper when shopping. A topper is simply a mini version of a regular mattress that provides comfort for you to sleep. It is designed for placement on a regular mattress to protect it from sweat, dust, dirt, and other environmental conditions. RVers with old beds which are struggling to hold up structurally may invest in toppers to breathe a new lease of life into their sleep quality. These toppers are placed on the worn out beds for increased comfort and support. If you’re an RVer without the right amount of space to accommodate a regular mattress then you may find toppers very attractive. Also, if the mattress that shipped with your camper is too thick or too thin for comfort, adding a topper could be a really smart decision. Often the type of mattress you purchase will depend on the type of RV owned. 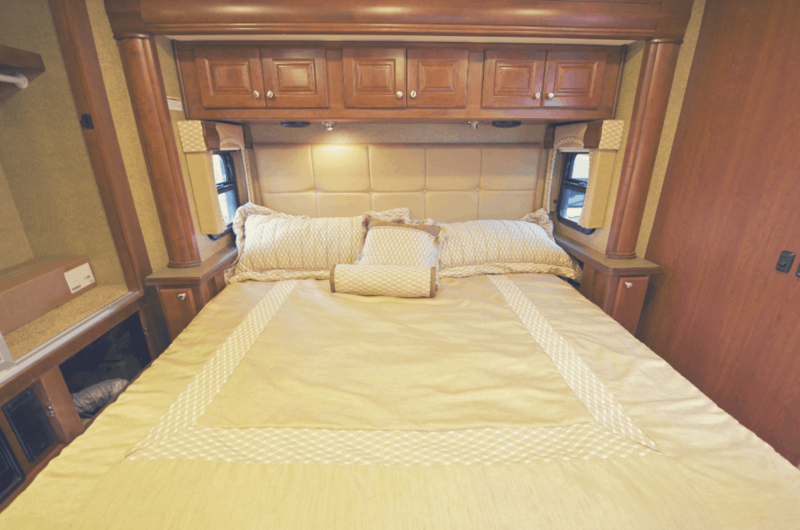 Here are the most popular RV types and their bedding considerations. These are the types of recreational vehicles engineered to be driven, unlike others which can only be moved with the help of a tow truck. They tend to be the priciest type of RVs on the market and the largest as well. The good news is that motorhomes can be driven legally without owning a commercial driver license unlike regular vehicles of a similar size. Class A: These are the most impressive types of motorhomes thanks to the huge amount of integrated space and ton of impressive features. It is not uncommon to come across Class A motorhomes with King or Queen-sized beds although a few feature bunk beds too. Class B: Typical vehicles in this category measure anywhere from 30-40 feet. Their interiors may be slightly less spacious when compared to Class A models but they usually make up for this with considerable storage space underneath the wide range of fixtures. While a few of these feature larger beds, standard models come with smaller sleeping space which makes bunk beds or mattress toppers much more sensible. Class C: Measuring anywhere from 20 to 30 feet, these types are usually engineered into the chassis of existing vehicles. There’s typically a door which links the cab to the interior section of Class C motorhomes. 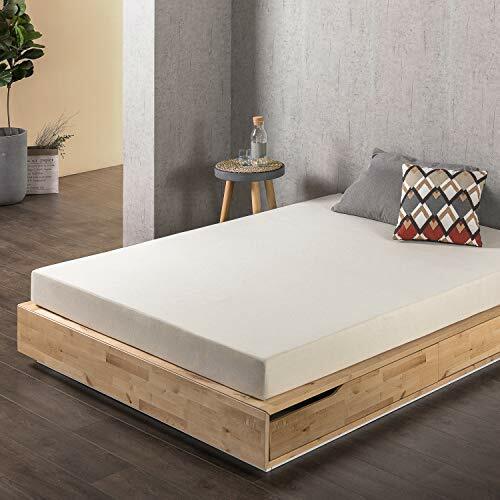 Mattress toppers are often the best fit for these types due to the limited space available which makes it impossible for the integration of full-sized beds. These are the largest types of towable trailers available on the market right now. They get their name from the fifth-wheel hitch, a type of pickup truck used for towing these trailers. Their large sizes mean a majority of fifth-wheel trailers come with enough space for full-sized beds although there may be a few exceptions. Travel trailers are also quite popular thanks to their extended lengths and integration of some of the most important amenities to enhance your comfort whether you’re living temporarily or permanently in one of these motorhomes. Fold-out beds are the most popular in travel trailers due to the limited available space as a result of their extremely narrow design. 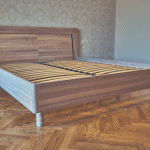 Mattress toppers can be easily integrated with these beds to guarantee a comfortable sleeping experience. Pop-up trailers are the most compact types of towable trailers. Featuring small sleeping quarters, they’re popular among those who prefer short camping trips lasting anywhere from just a couple of days to a week or two. Due to their limited space, you’ll probably have to settle for a mattress topper instead of anything thicker. 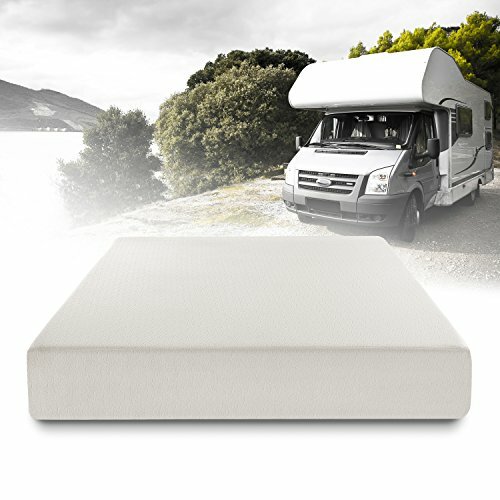 The type of foam material can’t be ignored when choosing an RV mattress. Here are the most popular types of material as well as their merits and drawbacks. Latex foam makes great RV mattresses thanks to their often comfortable and superior build as well as long lifespan and supportive nature. Even on exposure to harsh climates, these types of foams are naturally durable thanks to their antimicrobial qualities. The downside is that they may be too heavy and cost much more than all of the other models. 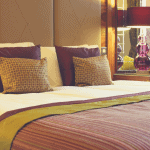 These are often low-profile mattresses which take up minimum space. They’re usually lightweight and available in thin profiles. On the upside, memory foam RV mattresses are typically affordable and can be snapped up for just a couple of hundreds of Dollars. They’re also a bit more compact which can come in handy due to the often limited spaces available in most RVs. However, it is important to know that some RVers find memory foam mattresses a bit on the firmer side. Innersprings feature heavily among campers and those living in vans and trailers thanks to their thin profiles and low price tags. They tend to fit better in limited spaces which is the reality of life in most RVs. The downside is that the exposure to wide-ranging weather elements makes them prone to rust due to their built-in metal springs. Hybrid mattresses give RVers the best of both worlds. They’re also very supportive and extremely comfortable for the majority of sleepers. Unfortunately, these hybrid trailer mattresses are quite rare on the market as a result of their expensive price tags and thicker-than-usual profiles. 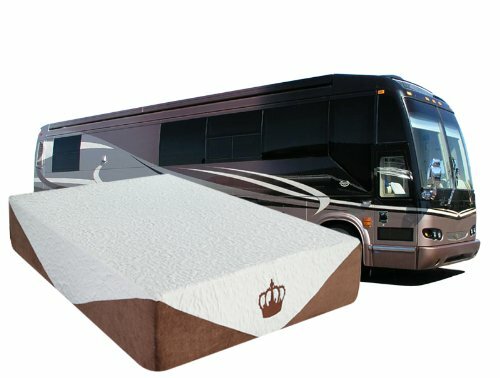 How much money have you set aside to purchase an RV mattress? Most models cost anywhere from around $150 to just under $500 depending on the quality of the build as well as the size and brand. Always try to get a durable model that can last several years before the need for a replacement pops up. There is a wide range of sizes to choose from depending on the type of bed frame in your RV. The truth is a Short Queen Size is usually the best for RV mattresses as long as there’s enough bedspace for it. Make sure you purchase a model that’ll fit your bed frame snugly for the ultimate sleeping experience. 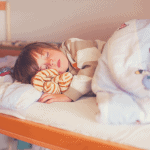 Even RVs with the largest sleeping quarters may struggle to fit 12-inch mattresses. This is why the majority on the market measure 6 inches on the average. If you desire something thicker then you should target a model measuring 8 inches as they’re usually pretty good to keep you comfortable. Most RVs ship with mattresses which are a bit firmer than usual. However, those who prefer soft mattresses are not completely left out as there are much softer options available if you decide to shop for your own mattress. These are usually manufactured from memory foam and to some extent, latex. Does your preferred RV mattress model come with any form of warranty? This is another important consideration during the shopping process. Remember, buying an RV mattress can be a significant investment. Therefore, it is a great idea to seek some sort of insurance should things go wrong through no fault of yours especially within the first few weeks or months after purchase. The Live & Sleep Ultra RV Mattress offers the ultimate luxury hotel sleeping experience from the confines of RVs, trucks, or camping vans. It is engineered with a 2.5-inch Premium Air Flow Memory Foam augmented by an extra 1 inch of Gel-Infused Visco Memory Foam. To provide an exceptionally thick profile, this mattress also features an 8.5” High-Density Support Base. 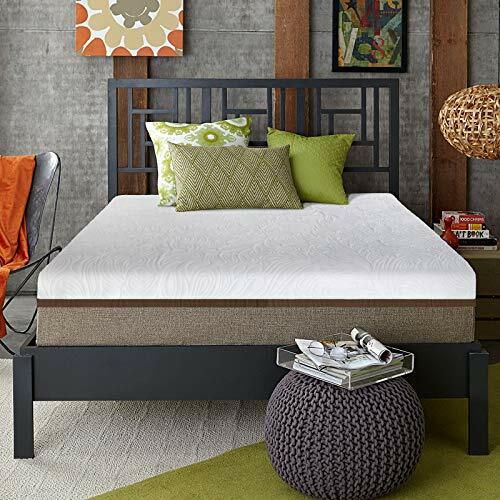 This mattress is derived from some of the highest grades of memory foam available in the industry right now and formulated to provide 5-Star cooling and breathability throughout those warm summer nights. The classic medium-firm high-density core provides long-term relief for pressure points thereby increasing the quality and duration of your sleep by eliminating tossing and turning. Buy the Live & Sleep Ultra RV Mattress now if you’re looking for a model with an amazing signature feel that recharges your batteries with a deep, restful sleep every single night. 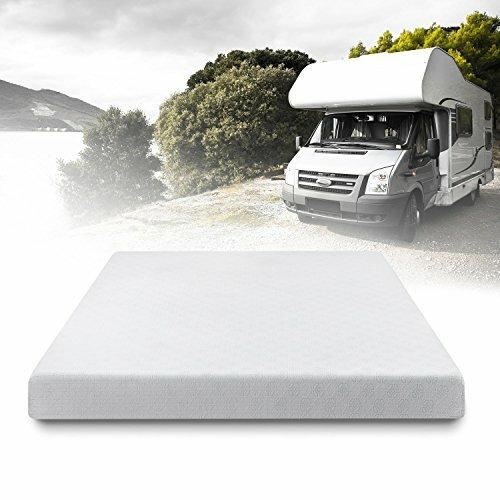 The Best Price Memory Foam Mattress comes in a special body-conforming memory foam material that delivers a cloud-like feel from your camper or RV. The top features a rich Poly-Jacquard fabric which feels plush on the skin and allows you to sleep with comfort even in the absence of high-end bedding. It is extremely comfortable and highly recommended for camper couples thanks to the built-in Integrated Responsive Action Suspension feature which isolates motion transfer throughout the foam. This ensures that your partner’s body movements do not affect your sleep regardless of how frequent they occur. This trailer mattress also distributes the body weights of sleepers evenly which leads to amazing relief from the most troublesome pressure points. The mattress stays fresh throughout its lifetime due to the integration of Best Price’s ActivFresh technology. It comes in the form of charcoals and other odor absorbing particles infused into the mattress. The 10-year manufacturer’s warranty is another reason why this model is the top-selling RV mattress online today. The Best Price Memory Foam Mattress is a smart purchase for anyone scouting for a quality RV mattress on a budget. 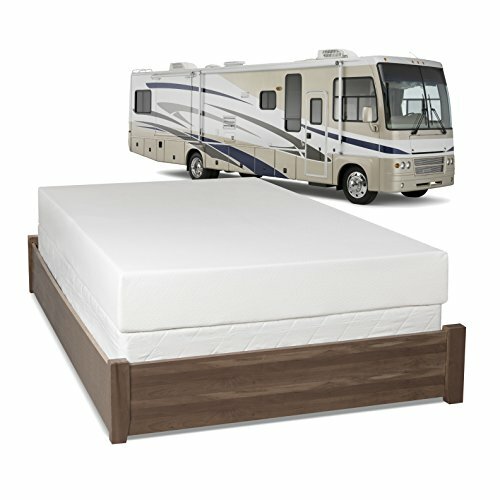 This RV Mattress stands out among its peers due to the fantastic craftsmanship and quality of its components as well as its unique finish. The Serenia Sleep Memory Foam RV Mattress is designed with a top layer made from 2 inches of 5-star pressure-relieving memory foam weighing 2.5 pounds which cradles your body and gives that comfortable feel you’ve always dreamed of. 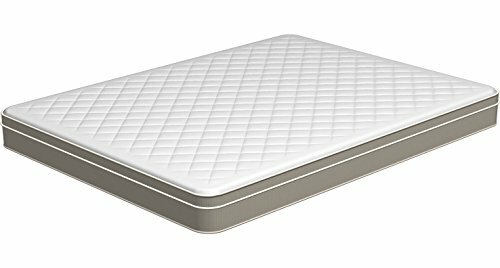 Underneath this is a 6-inch base foam with a plush 4-way stretch knit cover which provides support for the top layer and ensures that the sleeper gets the right amount of shut-eye on a nightly basis. This model is easy to lift for placement on any RV bed frame. It is compressed and roll-packed for easy shipping. However, once you follow the simple instructions, it should expand to its full size on your bed within 72 hours after removal from its package. The Serenia Sleep Memory Foam RV Mattress is a must-buy if you’re looking for cool and comfortable sleeping in your RV or camper van. The DynastyMattress RV Memory Foam Mattress brings next-generation sleeping pleasantness to your trailer or recreational vehicle. This camper van mattress comes in a 4-layer construction consisting of a 2.5-inch open cell memory foam at the top as well as 2 inches + 2 inches of Cool Airflow foam. An extra foam measuring 3.5 inches acts as a base layer to provide the required support for the sleeper. If you’re one of those people whose bodies heat up on any type of foam mattress pad or topper, you’ll be amazed at how cool this RV mattress sleeps. Thanks to the thickness and density of this mattress, people with chronic night sweat problems say they’re able to sleep cool on this model and wake up feeling fresh. The quality of the memory foam used for this mattress provides natural contouring for the body’s most delicate pressure points. This ensures efficient relief from back pain, neck pain, and other types of pain. Order the DynastyMattress RV Memory Foam Mattress now if you’re tired of night sweats and searching for the ultimate sleeping experience. This truck/trailer mattress is simply terrific to sleep on especially if you have a bad back and desire a mattress that isn’t too hard or soft. The Sleep Master Ultima Comfort Memory Foam RV Mattress is manufactured from top-grade conforming memory foam to provide the right level of support for a better night’s sleep. Additionally, it contains the most innovative type of memory foam known as BioFoam which keeps the mattress fresh for decades with its natural plant oil content instead of the usual petroleum-based components used by manufacturers in traditional memory foams. 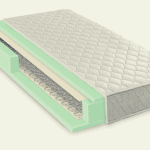 Every inch of foam integrated into this mattress is CertiPUR-US certified for functionality, durability, and content. Therefore, you can rest assured that you’re investing in a mattress that will deliver great value for money. This RV mattress comes with a limited 10-year warranty so you can buy with absolute confidence. The Sleep Master Ultima Comfort Memory Foam RV Mattress is a no-brainer if you’re desperate to rest easy with all the perks of memory foam support in your RV, truck, or trailer. The Parklane Explorer RV Mattress is the first-ever pillow-top mattress engineered exclusively for campers and RVers. It delivers all the sleeping comforts of home and then some. If you plan to spend long periods of time in your trailer or intend to live on any type of mobile home permanently, you deserve to be treated to a mattress that gives you the level of sleep you can look forward to way before bedtime. This RV mattress is well-constructed and very supportive which makes it a good fit for those of us who are larger than average. It sleeps people who weigh 250 pounds and over with distinction. It is easy to set up once the package arrives in your camper. All you have to do is to set the compressed mattress on your trailer bed frame before cutting the corners of the plastic package and watch the mattress expand to its full designated size on the bed. Additionally, it provides a lot of support for the spinal area which can be a great benefit for people with bad backs and some categories of pregnant women. The Parklane Explorer RV Mattress should be top of your list if you’re hunting for a quality innerspring mattress with genuine levels of sleep satisfaction for life in an RV or trailer. This RV mattress is exceptional even by the most stringent standards and the fact that its price can’t be beat is another reason why I’ve fallen in love with it. The Zinus Gel-Infused Green Tea Memory Foam Mattress is perfect for all kinds of campers, trailers, RVs, and truck bed frames. It is infused with green tea extract and natural castor seed oil which effectively retards bacteria and eliminates all kinds of odors. This can come in really handy in recreational trucks that get stuffy quickly which ultimately lead to odors. Additionally, the mattress suits the needs of Stomach, Back, and Side Sleepers in unison. Zinus offers a generous 10-year limited warranty which can be explored in the event of performance issues after purchase. The Zinus Gel-Infused Green Tea Memory Foam Mattress is the perfect choice if you’re serious about owning a trailer mattress specially engineered for all kinds of sleepers. The Live & Sleep Ultra RV Mattress stands out as the best RV mattress for anyone with enough space to accommodate it. It is a truly well-engineered model designed to give you the same amount of sleep luxury as a 5-star hotel bed even if you find yourself thousands of miles away from civilization. The fact that it comes with such an economical price tag is another reason why many RVers cannot help but fall in love with this RV mattress. 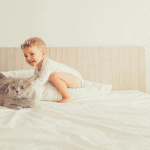 Best Mattress for Bunk Bed 2019 – Your Kids Can Finally Sleep!